The project was one of nine selected for the 18th annual Wisconsin Idea Fellowships, a program that awards undergraduate projects working to solve issues identified by local or global communities. Fellowships are awarded to semester-long or year-long projects designed by an undergraduate student or group of students in collaboration with a community organization and a UW-Madison faculty or staff member. The projects, which are all rooted in the concept of addressing needs identified by community partners, range in topic from public health, to agriculture, college-preparedness mentoring, poverty and more. A total of 15 UW-Madison students are part of this year’s projects, sponsored by the Morgridge Center for Public Service. The WIF selection process is highly competitive, with successful projects receiving both logistical and financial support—up to $7,000. Some projects will begin this summer, and some may last through next May. 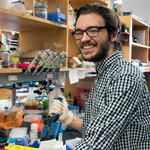 Stephan is a member of the Kiessling lab.